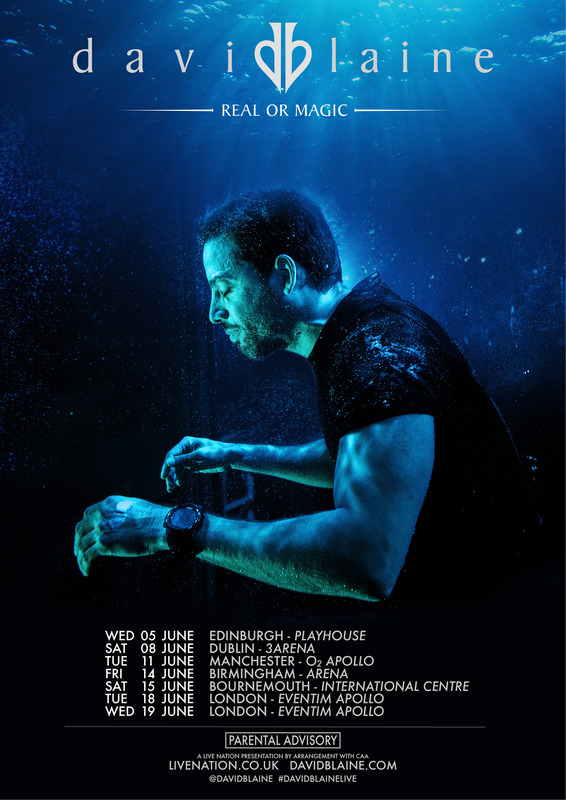 David Blaine will demonstrate his unique style of modern magic and experimental performance techniques in his first ever UK and Ireland tour. The American illusionist and magician will entertain audiences in Edinburgh, Dublin, Manchester, Birmingham, Bournemouth and London in June on his Real or Magic tour. The tour is described as “an experiment in and of itself”, with the promise that “no two shows will be exactly the same”. A one-man show, his interactive performances will combine Blaine’s sleight of hand with his death-defying endurance acts. Blaine, 45, rose to fame in 1997 with his debut TV special Street Magic, and since then has hosted a number of programmes and has pushed his body to the limits in a number of dangerous stunts. The tour comes more than 15 years after Blaine spent 44 days suspended in a glass box over the River Thames. He made headlines for the 2003 feat, during which he was on camera at all times and did not eat at all. His other stunts have included being buried in a clear coffin for one week in 1999, and standing atop a 30-metre pillar without a safety net for 36 hours straight in 2002, both in New York City. Tour promoter Live Nation has warned Blaine’s performance will only be suitable for viewers aged 13 or over. Tickets go on sale on Friday March 29 at 9am.